Our Flow Mach 2 Waterjet was a tremendous upgrade from our last Waterjet. With the latest cutting edge technology. 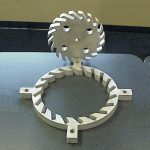 No matter what material you have in mind for your project, wood, marble, granite, plastic, titanium, stainless steel, aluminum, hot rolled steel, cold rolled steel we have cut it in our Waterjet. We even cut thicknesses from 22 Ga. to 4.00″ thick. For example, Team JLMC, Inc. has cut baseball players 6ft tall, full-scale airplanes, stagecoach with horses, cars, Palm Desert sign on overpasses, “Made In Ontario” signs, name tags, Amgen tour plaques, school logos, bottle openers as well as fish shaped key chains. You name it, we can do it.